Enter the RBI Baseball 18 All-Star Xbox Sweepstakes right now for your chance to win Custom R.B.I. Baseball 18 American League or National League All-Star Game Xbox One S and One (1) R.B.I. Baseball 18 Xbox One Game. How To Enter: During the sweepstakes period go to this link: https://www.mlb.com/forms/rbi18-all-star-xbox-sweepstakes and follow the online instructions to register by entering all information requested on the registration form and once you filled out the entry form now Click on the submit button to complete the registration form. Who Can Enter: This sweepstakes is open only to legal residents United States and and Canada (excluding the Province of Quebec) who are eighteen (18) years of age or older at the time they enter the sweepstakes. 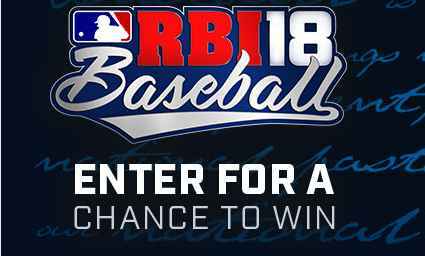 When To Enter: The RBI Baseball 18 Sweepstakes entry begins at 09:00 a.m. Eastern Time (“ET”) on June 27, 2018, and ends at 4:59 p.m. ET on July 25, 2018. Who’s Sponsor: The Sponsor of this Sweepstakes is MLB Advanced Media, L.P., 75 Ninth Avenue, New York, NY 10011.